Copper is best know for it's ability to transfer heat away from the body and most of you know about the benefits of wearing copper bracelets or garments but did you know all the benefits of sleeping on copper? 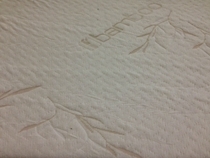 Let me share with you 4 surprising benefits of copper infused latex mattress toppers. 1. Copper is Antimicrobial and Antibacterial. It naturally destroys a lot of harmful microbes and bacteria including E-coli, various fungi and bacteria. When bonded with latex, copper ions can inhibit the growth of these bacteria and microbes and thus preventing odors from developing. 2. Copper can help you look and feel younger. Copper has long been used as a healing agent. Your body needs trace amounts of copper to produce Collagen. Collagen is essential to the production of the elastin that keeps your skin firm and youthful and also essential in the healing process for bones and connective tissue. Drinking water out of a copper pitcher or sleeping on a copper topper can have positive effects on your appearance and health. These copper ions help your body produce more Collagen which in turn improve your overall health and appearance and speed up the healing process. 3. Copper can help prevent Osteoporosis. Usually you hear about the importance of getting enough calcium to prevent bone loss, the body needs some help to put that calcium to use instead of taking calcium from the bones. Copper, magnesium, zinc, and vitamin D are all extremely beneficial to this process. 4. Copper can act as an Anti-Inflammatory. You've seen the copper infused knee braces and elbow pads and now you have our copper topper to aid in pain relief. One of the major benefits of copper is it's ability to diffuse heat. 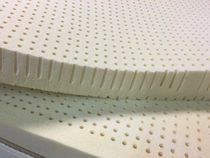 Latex is already very good at this due to it's open cell structure but add copper to the mix and you have the best of the best in providing a comfortable nights sleep. Copper has natural anti-inflammatory properties that create a non-magnetic platform that brings relief from arthritis, bursitis and rheumatism. A sleep product made with Talalay Copper will naturally combat restlessness and encourage brain stimulation while a person sleeps. 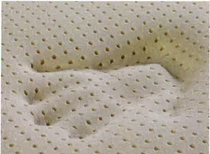 By using Talalay Copper, manufacturers can provide a product that is naturally hypoallergenic and dust mite resistant, using anti-microbial fibers to inhibit the growth of bacteria, mold and mildew which is ideal for consumers who suffer from severe asthma or allergies. This product is 3" thick and available in #15 ILD (super soft) #21 ILD (Soft) and #27 ILD (Medium). Ships rolled and compressed in the raw. Zippered covers are also available. The closer you are to this topper the more benefits you will receive so we recommend using this without a mattress protector.